TAKE A FLASHLIGHT/GLOW STICKS TRICK-OR-TREATING WITH YOU. WEAR REFLECTIVE TAPE ON COSTUMES. TRAVEL IN GROUPS! THERE IS STRENGTH IN NUMBERS. NEVER TAKE OR CONSUME UNWRAPPED CANDY. CHECK YOUR CANDY BEFORE CONSUMING. MAKE SURE YOU ARE IN A WELL LIT AREA. STOP, LOOK & LISTEN BEFORE CROSSING THE STREET. DO NOT USE MASKS/FACE PAINTING TO COVER UP YOUR EYES. LET OTHERS KNOW WHERE YOU PLAN TO BE. TRICK-OR-TREAT WITH AN ADULT! EVEN ADULTS SHOULD NOT TRICK-OR-TREAT ALONE. Following these steps will NOT guarantee your safety, but they will aid in encouraging it. This is also not to take away from the blessings and the fun that take place during the holiday season, we just want you to be aware of the possible dangers that can come along with refusing to recognize that human trafficking is real. It does NOT discriminate and can happen to anyone at any time…especially in situations like these. We hope that you have a blast and stay safe for this Halloween and holiday season. 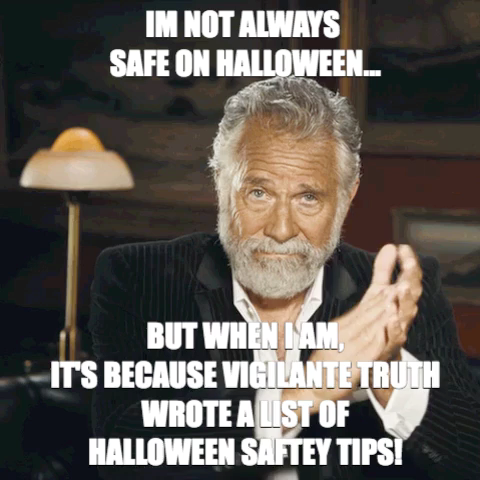 If there are any Halloween Tips that we forgot to mention, that you think are important to know to help keep others safe, please feel free to comment them on this post or share on your social media and tag us in them.